Everest Poker (www.EverestPoker.com) has been a leading international online poker room since 2005. With successful players, consistent payouts, and a great selection of promotions and rewards for loyal players, Everest holds its own as a smaller but effective poker site. Hosting some major events like the Everest European Poker Championship, the live and satellite games are as popular as the online tournaments and ring games. Everest is particularly good for Hold'em and Omaha players who may find the lack of many other game variations a helpful focus for their poker attention. While the software is stable and well-built, offering high quality poker graphics, smooth play and resizable tables, it is more simple in comparison to other major poker rooms. One advantage to the more direct and less flashy software component at Everest is that players have the ability to play up to eight tables at once and still scale the tables effectively while retaining large size cards. Tracking the multi-table play is much easier with the simplified graphics. In addition, Everest Poker offers a training room for new players to test their skills in some practice games before moving into real money play. There are quality player avatars and hand histories available for 30 days so that players can track their game progress. Everest continues to update their software, particularly as players make improvement suggestions such as the recent lobby redesign for better navigation. 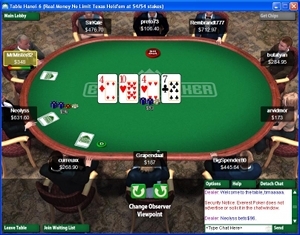 At low traffic times, players can drop to around 3000 to 4000 online, at just fewer than 600 tables. At peak times, however, the international community comes out in force. High traffic times can see upwards of 23,000 players on ring game and tournament real money tables. The player distribution is usually that two-thirds of the peak traffic players are participating in the various tournament games and one-third remains at ring games. One of Everest's features is that players can compete in 15 different languages. There is a spirit of global community undergirding the competition on Everest Poker. However, players still compete hard for the prizes at Everest and a strong core of regular Everest players do make their presence known in the poker rooms. Lower stakes players tend to be solid and consistent. Everest has a presence about its poker room that encourages new players to learn solid poker and master the skills of the game, offering tools and the training room to solidify players for a longer tenure on the site. There also seems to be a consistent looseness about some players at every level, with many of those being in the medium and higher stakes games and tournaments. For experienced and savvy players, that makes a game difficult to pass up. With players' notes and interactive chats, wise players can learn who their tough competition is and who they'll find very comfortable to meet around the table when they're looking for some ways to make bank from loose players. Currently, the bonus is $400 when players sign-up for a new account. At times the flat rate bonus reaches up to $500 for extra bonus promotions. In any case, new players are welcome to deposit any amount--$10, $20, $100 and they will receive the $400 bonus. The bonus money is released in incremental payments when players earn Summit points for real money play. For every dollar in rake, players earn one Summit Point. For every dollar in tournament fees, players earn up to eight points. Even partial dollar amounts get credited for players' Summit point totals. Summit points not only free up the bonus deposit, but also unlock participation and gifts in Everest's online poker VIP programs. In addition to the bonus bucks and points, new players have an entry into a new depositors freeroll tournament. For newly registered players who make a first deposit within 30 days of setting up their player's account, a freeroll token is added to the account. This is used to register for the $1000 weekly freeroll for new depositors, which takes place Mondays and Thursdays at 19:30 GMT. Players receive the token automatically, but still need to actively register for the tournament. One of the offerings from Everest Poker is a generous loyalty program for VIP players called the VIP Summit Club. All players at Everest Poker are welcome to enroll in the Summit Club. Players earn Summit points from all real money games that add to their account and provide bonuses at several different points levels. Summit Club members have access to $5000 tier-level freerolls, occurring weekly. Each month players can earn up to $5000 in bonus cash as well as have their Summit points boosted up to 900%. There are seven tiers of the Summit Club, and players receive the benefits of their tier for a guaranteed month, except at the top two levels, which give you three months of guaranteed tier benefits. The levels are calculated by the total number of points a player earns in the previous calendar month. Members of the VIP Summit Club can convert points to cash, earn bonus points to boost totals, register for tournament buy-ins with point options and purchase gift and merchandise in the Summit store. At Everest Poker, the community of poker players is both a learning community and one that rewards active and regular poker play for Hold'em and Omaha enthusiasts. With rewards and easy-to-access features, Everest Poker is a common choice for players who like straightforward poker action. Everest Poker is open to most international players (U.S. players are not allowed) and registration and software are free. Everest supports some of the most common deposit and withdrawal means for online poker rooms. Credit card and debit card deposits from Visa, Visa Electron and MasterCard are welcome. E-wallets such as Moneybookers, Click2Pay, Entropay and Neteller are secure and popular ways to make instant deposits and withdraw winnings back into the same account. E-wallet withdrawals typically process within one business day. Additional pre-paid cards like Paysafecard and direct banking options don't support withdrawals in the same means, so a separate withdrawal feature need to be registered on a player's account. Everest also supports withdrawals in checks, which can take up to six weeks to receive. With check withdrawals as with any of the deposit and withdrawal means, Everest may randomly ask for identity verification to make sure the player's account remains secure. Ready to Play? Visit EverestPoker.com to sign up, and don't forget to use bonus code EN400 for the 100% up to $400 bonus!